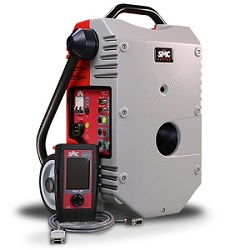 The SMC Raptor is a new generation of Primary Injection Test System that is designed to make the commissioning and maintenance of substations easier, faster, and more convenient. 550 x 440 x 230 mm / (21 ½ x 17 ½ x 9)in. 85 mm / 3½ in. 110 x 185 x 35 mm / 4 x 7 x 1½ in. High quality injection-moulded ABS, strong and ergonomic design, edge surfaces protected with TPE non-slip material. Magnetic base. The instrument is intended for use in high-voltage substations and industrial environments. It conforms to CE-marking directives, complies with IEC and international standards, and is designed and manufactured in accordance with the requirements of the ISO-9001 Quality Standard.